Dorm Co. Tip: Dorm rugs are essential college supplies! Expecting soft dorm carpeting in your college dorm room? Unfortunately, you'll have cold linoleum. The dorm floor is often a shock to college students - after all, you're used to plush carpeting in your own room at home, so that is automatically what you think your college dorm room will have. However, just because your dorm floor is starting out with cold linoleum, that doesn't mean that it has to stay that way. You can add simple dorm essentials to make your dorm floor feel more comfortable and add to your dorm room decor. 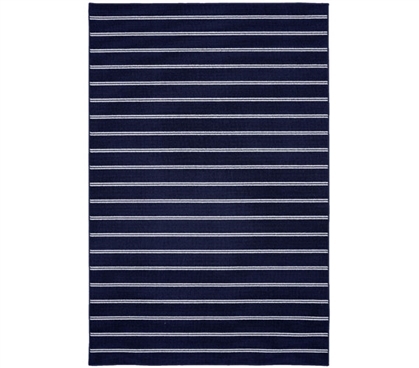 Our Classic Stripes College Rug in Navy has a simple style that will go a long away. 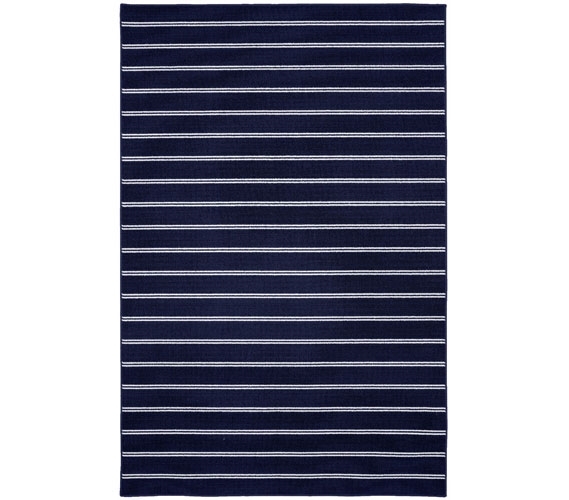 Featuring stripes across a navy backdrop, this simple design will allow you to easily mix and match your other dorm room decorations with your dorm rug to create a complete and comforting look in your dorm room. Along with that dorm floor being a not great looking linoleum, it will also be quite a shock when you put your feet on it in the morning as it will be pretty cold. With our Classic Stripes College Rug in Navy by your dorm bed, though, you can step on a college rug that won't unpleasantly wake you up.